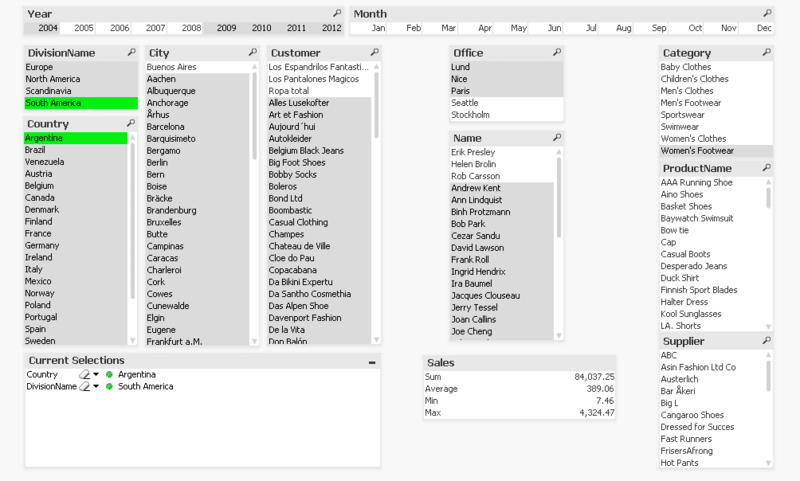 We can sometimes forget just how powerful this feature of QlikView is. It is so simple - you click on a value and it goes green; anything that is associated with your selection stays white; anything that is excluded by your selection goes gray. What could be more simple? From a data discovery point of view, this is an enormous boon. Other tools allow you to drill down into the data with lots of different options (even Excel - although I am not really impressed with the facility from the much vaunted Tableau!) 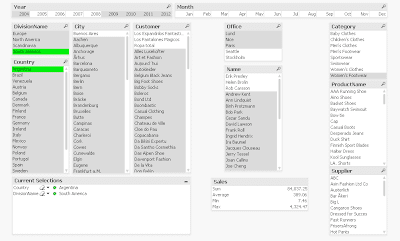 but QlikView is quite unique in giving you visibility of the excluded values. Of course, one of the problems with List Boxes is that, to make them really useful, they do take up quite a lot of space on a layout. I have blogged about different strategies for this in the past - for example, using a container for list boxes - but nothing quite replaces the ability to see a wide range of multivariate data in one place. For this reason, I quite often create a tab that pretty much just has list boxes. All the primary fields of information will be represented. Why is it that we don't sell Women's Footwear to Argentina? Raise a flag to the Green, White and Gray - just one of the many reasons why I love QlikView.